"An indulgence is the remission of God of a temporal punishment to to sins whose guilt has already been forgiven. The faithful... can acquire this remission through the Church..."
Partial indulgences free one from part of the temporal punishment due to sin. Plenary indulgences free one from the whole of the temporal punishment due to sin. "In order to gain a plenary indulgence, one must perform the prescribed work and also fulfill three conditions: sacramental Confession, Eucharistic Communion, and prayer for the intention of the Supreme Pontiff." Also, all attachment to sin, even venial sin, must be absent. If any of these prescribed conditions have not been met, then the individual will gain a partial indulgence. 1. Acts of faith, hope, charity, and contrition, according to any good formula. 2. A Visit of adoration to the Blessed Sacrament. 3. "We give Thee thanks, Almighty God, for all Thy benefits, Who lives and reigns forever and ever. Amen." 4. Reciting the Prayer to Our Guardian Angel. 5. Recitation of the Angelus or (the Regina Caeli during Easter Time). 6. Recitation of the Anime Christi. 7. For visiting a cemetery and praying for the departed. This is applicable only to the Holy Souls in Purgatory. 8. Spiritual Communion, according to any devout formula. 9. Devout recitation of the Apostles' Creed or the Nicene Creed. 10. For teaching or studying Christian Doctrine. 11. For reciting the Prayer before a Crucifix. 12. Pious recitation of the Act of Reparation. 13. Pious recitation of the Act of Dedication of the Human Race to Christ the King. A Plenary indulgence is gained if recited publicly on the Feast of Christ the King. 14. For each of the following litanies: The Most Holy Name of Jesus, The Sacred Heart of Jesus, The Most Precious Blood of Our Lord Jesus Christ, The Blessed Virgin Mary, St. Joseph and the Litany of the Saints. 15. Recitation of the Magnificat. 16. Recitation of the Memorare. 17. For devoutly making use of an object of piety (sacramentals) properly blessed by any priest. 18. For spending some time in devout mental prayer. R: The Lord preserve him and give him life, and make him blessed upon the earth, and deliver him not up to the will of his enemies." 20. For devoutly and attentively being present at a sermon. 21. "Eternal rest grant unto them, O Lord, and let your perpetual light shine upon them. May they rest in peace." This is applicable to the Holy Souls in Purgatory. 22. Recitation of the Holy Rosary privately, outside of a Church or public oratory. 23. For reading Sacred Scripture as spiritual reading, with the veneration and devotion due to the word of God. 24. Recitation of the Salve Regina. 25. For devoutly making the Sign of the Cross, saying the words "In the name of the Father and of the Son and of the Holy Spirit. Amen." 26. Devout recitation of Tantum Ergo. 27. "Come, Holy Spirit, fill the hearts of Thy faithful, and enkindle in them the fire of Thy love." 28. For renewing one's baptismal vows, using any customary formula. A Plenary indulgence is granted if done during the Paschal vigil or on the anniversary of one's baptism. From Purgatory by Fr. F. X. Schouppe, and published by Tan Books. Can be found at EWTN. Just make sure to scroll down a bit. Michelle of Rosetta Stone, whose blog link I also forgot to add to my sidebar (but that has been corrected), left me a about a little book, on a previous posting regarding Maria Simma. The little book is entitled The Amazing Secret of the Souls in Purgatory: An Interview with Maria Simma. My mom happened to have the book in her Catholic library. I would highly recommend this book for anyone who would like to help the holy souls and in turn help their living loved ones and themselves avoid a long stay in purgatory. ..."Yes, there are many. They didn't promote respect for the Eucharist. So faith overall suffers. They are often in Purgatory for having neglected prayer-which has diminished their faith. But there are also many who have gone straight to Heaven! I would advise him to pray much to the Holy Spirit- and to say his Rosary every day. Can be found at EWTN. However, the link will take you to the 4th day and you will have to scroll down to the 7th day. Every Wednesday, the morning Mass is moved to 8:30 a.m. instead of the usual 7:30 a.m. so that the parochial school children have an opportunity to attend Mass. This was the idea of the parish priest Fr. Patrick. From my observations and listening to his homilies, he seems to be a priest who really loves the Eucharist. This is evident when you see the children approach the altar for Holy Communion. You will see many receive on the tongue, even the youngest of them. They will then proceed back to their pews with their little hands folded in prayer. I remember one of Father's homilies about the time he went to Cardinal Ratzinger's installation as our pontiff. He arrived close to the time everyone had to take their seat, if they wanted a good seat. But instead of going to his seat, Father asked someone, where the Blessed Sacrament was. The young man who guided him to the Blessed Sacrament Chapel told him, he as the only one who had gone to the Blessed Sacrament Chapel FIRST. I might as well share his story about why Father was so intend on attending the installation. Seems that when he was in Rome one time, he had difficulty finding a certain tomb or grave. He saw a priest approach and he asked him where it was. The priest led him to the place personally. When the priest bend over, a bit of red poked out of his coat. He then realized it was Cardinal Ratzinger! I don't recall all the details but I think that was the gist of it. For a while now Leticia of Causa Nostrae Laetitiae has been promoting this movie. To be quite honest, it didn't really capture my interest in the beginning. However, after reading more about it and watching the trailer, I now want to do my part in promoting this pro-life movie. “If you want to make God laugh, tell him your plans.” This line, spoken by Mexican actor Eduardo Verstegui, opens the movie Bella. Eduardo Verastegui, one of the most successful Mexican actors in Hollywood today, has become one of the strongest voices against the legalization of abortion in Mexico City. He rediscovered the faith of his parents in the most unlikely place on the planet and he has no fear of public rejection for his denouncing of the holocaust of abortion. Verastegui has revealed his pro-life convictions to various Mexican media outlets and he has created an organization in California to help those in need, especially women who are seeking abortions. So, if BELLA, comes to a theater near you, consider yourself blessed and go see it and more importantly, spread the word. Thanks to Sue for sharing this one too! Pentecost is next Sunday, May 27th. Marianne, who is leading the Patron Saint of the Year campaign, is also offering to help us discern the fruits and gifts of the Holy Spirit that are ours for reflection and prayer. Her email is at the end of this message if you'd like her to pick some from her "Fruits and Gifts" bowl for you. I just received an email from someone whose Saint interceded for them just last week and her saint was picked before Christmas! Let me know what you think. God bless you abundantly! Many people have enjoyed having a patron saint "pick" them for the year ... There have been many testimonies on all the connections and intercessions that have occurred. How wonderful it is to know that we are not walking alone! NOTE FROM ESTHER: IF YOU HAVE ALREADY REQUESTED A PATRON SAINT FROM A Catholic Life IT IS ONE AND THE SAME. Where Can You Get the Best Tasting Bagels? Well, New Jersey of course! I have been looking forward to a hot bagel from our local bagelry. My sister picked some up for us the other morning. Was it worth waiting for! She got me onion bagels and a salt bagel. The salt bagel was a bit salty. I think I like the everything bagel the best though. 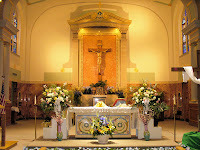 At my mom's parish, the Saturday evening Mass (to fulfill Sunday obligation) begins at 4:30 p.m. This seems a little early for an evening Mass. Does anyone know what the guidelines are for Saturday evening Mass in order to fulfill Sunday Mass obligations? We go this morning anyway, but I was just wondering.